This elegant and important carpet epitomizes the finest weaving produced by Ziegler & Company, one of the first European firms to begin designing and producing large carpets in Persia specifically for a discriminating Western clientele. Ziegler carpets are known for their beautiful composition, exceptional artistry, the use of the finest wool, as well as vivid natural vegetal dyes. This carpet, inspired by 17 th -century classical Persian design, contains deftly drawn sprays of vegetal scrolls, several varieties of palmettes, and just enough background space to subtly emphasize the unity of the composition without taking away from the individual rendering of each motif. The border does not simply frame the field; it rather smartly interacts with it. A triumph of balance and proportion, this carpet epitomizes the very best of Ziegler & Company’s design work. 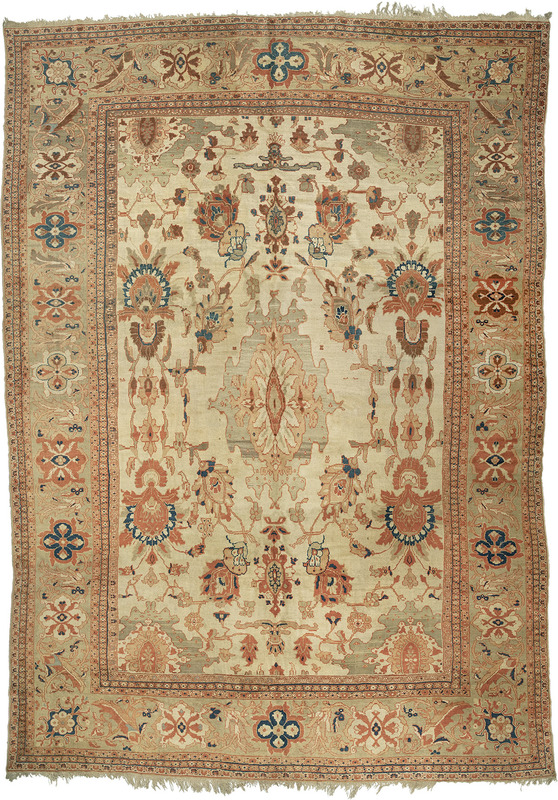 With great foresight, Ziegler’s late 19 th -century weavers were instructed to replace the traditional Persian palette with one more suitable to a Western aesthetic increasingly influenced by modernism. Employing a sophisticated combination of olive-khaki, ivory, cream, oyster, ochre, aubergine, and three indigo blues, the palette of this carpet is balanced by the proportional use of warm and cool tones. The result is a carpet rich in color, without being overwhelming, and therefore as suitable for today’s interiors as it was the day it was made. Without question, this extraordinary carpet is proof of the timelessness of Ziegler & Company’s vision, and why connoisseurs and designers alike continue to covet these fine examples of 19 th -century weaving.